I've been playing bass for almost 22 years (since I was 13, I'm 34 now) and I'm the bass player from Jota Quest, one of the most famous pop-funk bands in Brazil. Our label is Sony/Brazil and we have sold over 3,000,000 copies of our 5 albums. 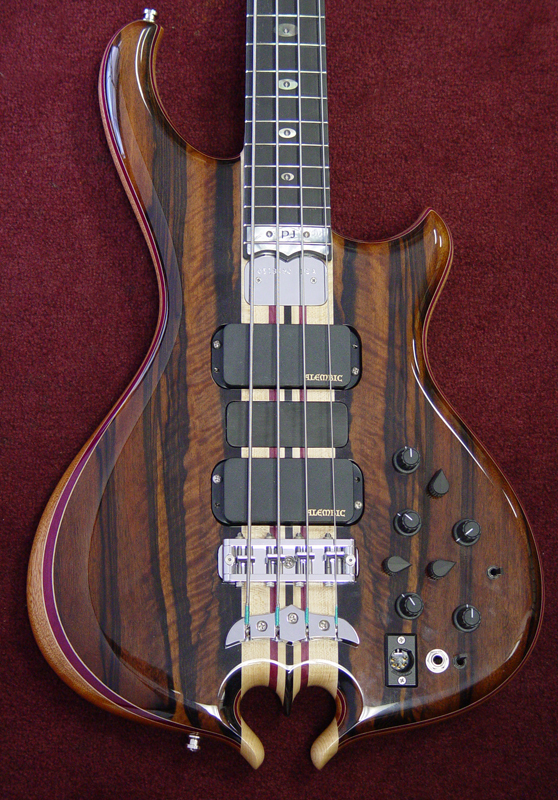 My first contact with Alembic was when I was begining to play bass in the 80's, my teacher showed me some Stanley Clarke albums and I remember I asked him what bass Stan was using to have that crazy sound! 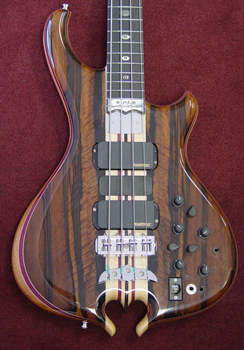 My teacher told me that Stan uses "Alembic basses," and I said how can I buy one? My teacher answered "forget it man, too much for you, who knows when you'll be a famous artist?" You can't imagine how hard it is for a kid from Brazil to buy a good bass guitar, especially an Alembic. Some time after my band was signed by Sony Music and soon I bought an Epic bass with the money that they gave us to buy equipment for us to record our first album. 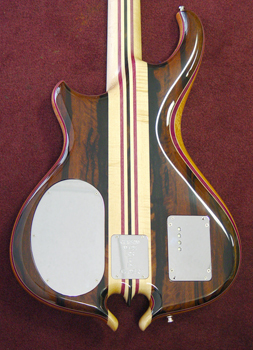 My devotion for Mark King and his sound inspired me when I was a young player, but I wasn't a MK clone. With my band's success I bought a Rogue bass, Brown Bass, Europa bass, Distillate bass and then I started my most ambitious project, to "HAVE MY DREAM BASSES FROM ALEMBIC." Rio is the first of them and I'm intending to continue this project. I have donated 10% of the price of Rio to poor people in my country, and I'll do the same for the other ones. Ah, the Ebony. 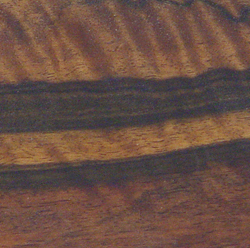 This particular piece of Macassar Ebony has a very rare flame figure. The colors are rich and varied, with tan and reddish bands streaking across the dark violet-brown background. The flame figure seems like ruffling silk in a breeze and looks three dimensional, but we can assure you it's sanded absolutely flat. 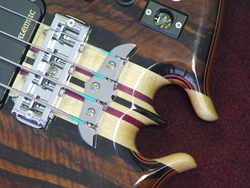 Across the 24th fret position, a mother of pearl inlay that follows the contours of the fingerboard. The letters P and J have been cut clean through the shell and then filled with a mixture of epoxy and Ebony dust (collected from levelling fingerboards). 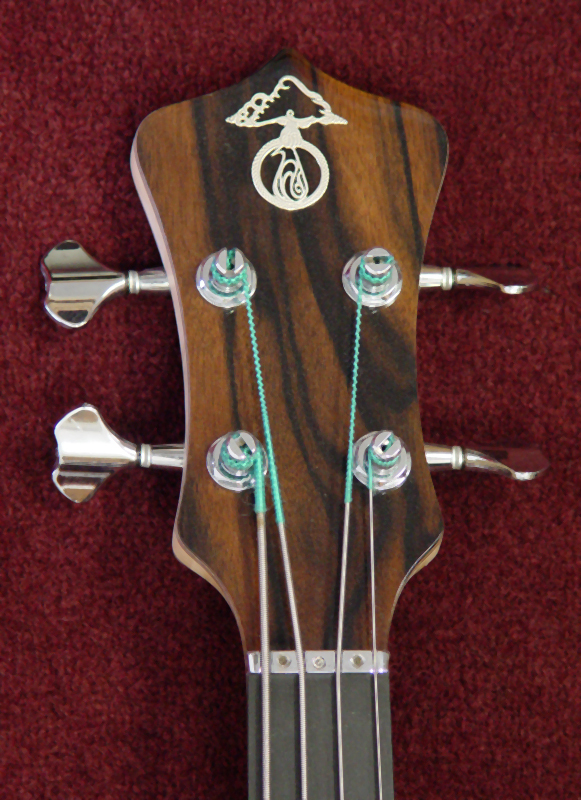 Also of interest is the micro-tiny mandolin fretwire. 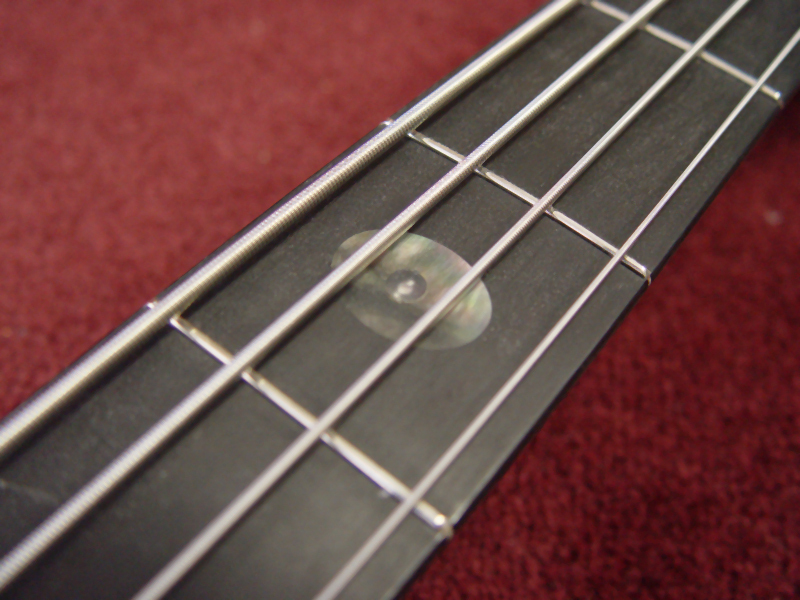 It's fairly difficult to install across wide bass fingerboards. 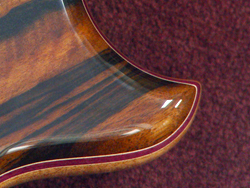 And while they wear much faster than our typical jumbo fretwire, it is almost possible to coax a fretless sound from a fretted bass with mandolin frets. Bridge, tailpiece, bridgeblock, string nut, and tuners are all chrome plated. This hard plating is over our normal solid machined brass parts. It won't corrode and only needs a modest wiping from time to time to keep its shiny new appearance. 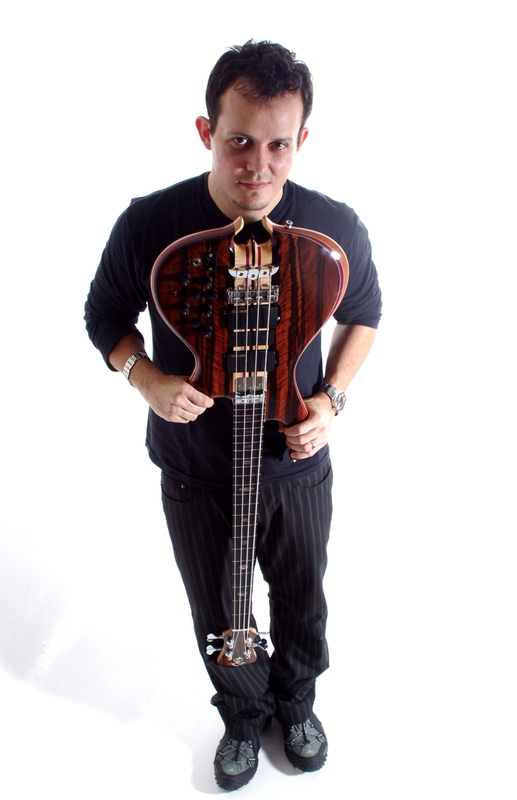 This issue is especially important for a player like Paulo that will be performing and touring with this bass. Rio has the Balance K body shape, and Paulo specified the Heart Omega variation. 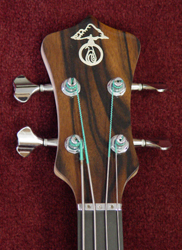 The bird tailpiece echoes the carving detail. Details, details. Purpleheart accent laminate is framed on either side with Maple veneers. When you look at the other pictures of this bass, notice how the accent laminates spread out along the tummy and elbow shaping contours. 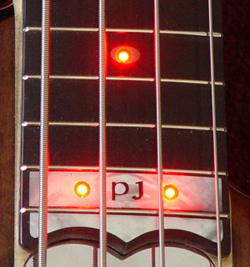 Paulo wanted this bass to have a different sound from the rest of the Alembics in his collection. The neck is the most significant part of the wood as far as the tone is concerned on a neck through Alembic bass. 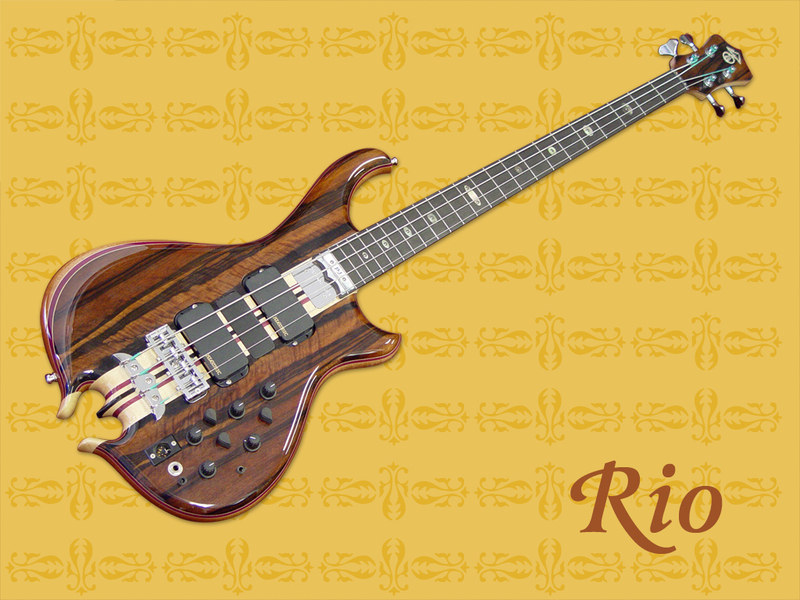 Using Ebony as the center neck laminate adds its signature extra bass response and fundamental sustain characteristics without an enormous increase in weight, especially since the top and back of Rio are Ebony. 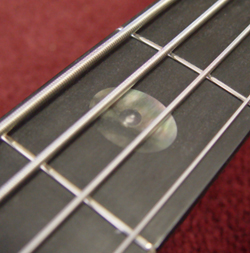 Just enough to be seen, the black Tahitian mother of pearl oval inlays mark 9 of the typical 10 positions. The smoky color flashes brightly with opalescent colors of pink and green in changing light. Superbright LEDs punch through for optional commanding light. It's all for the show, but superbright "Laser" LEDs are a treat for the audience. These LEDs are more than a thousand times brighter than the side position LEDs, and can be seen under spotlights and even with flash photography! 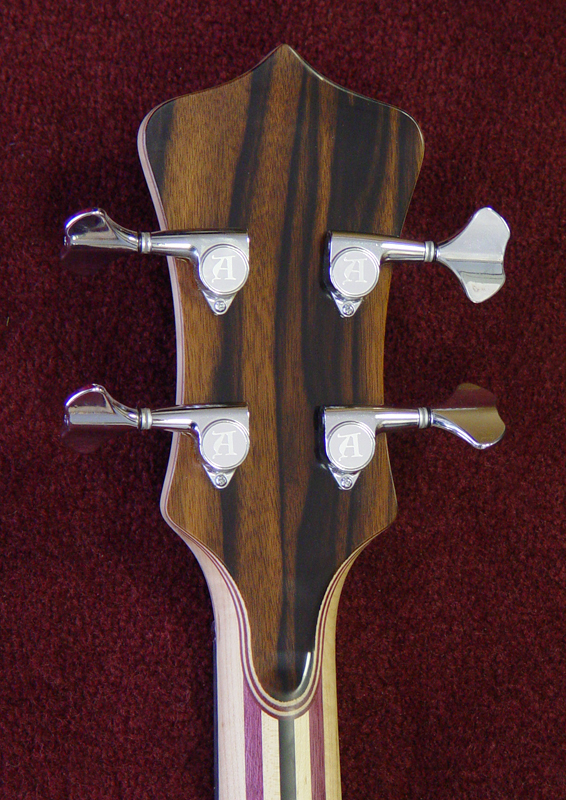 Classic Alembic Crown peghead is the natural match for the Balance K body shape. 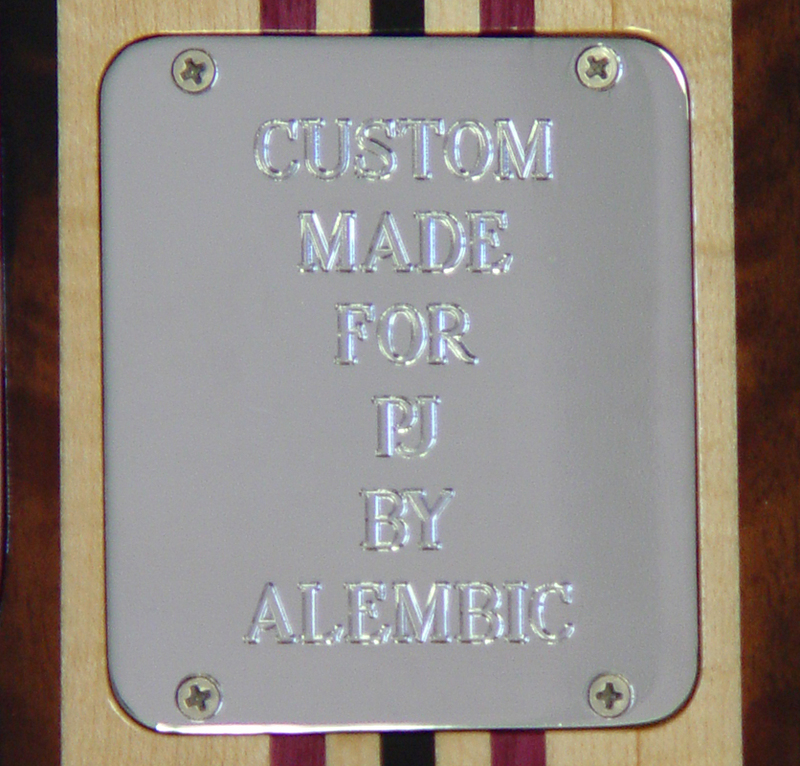 A simple Alembic logo in sterling silver decorates the front. 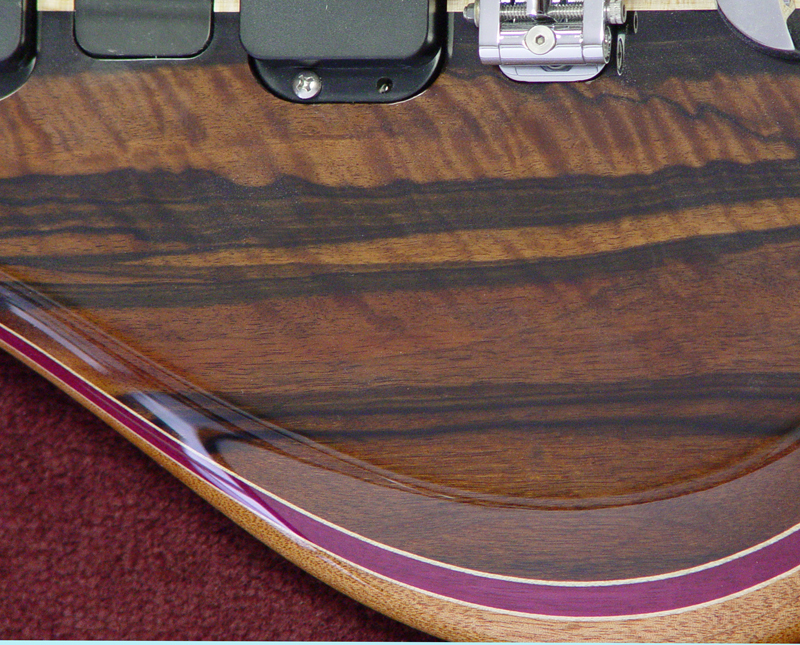 Usually the interior peghead veneers are alternating layers of Walnut and Maple, but since the accent laminates on Rio are primarily Purpleheart, Chip eliminated Walnut from the recipe. 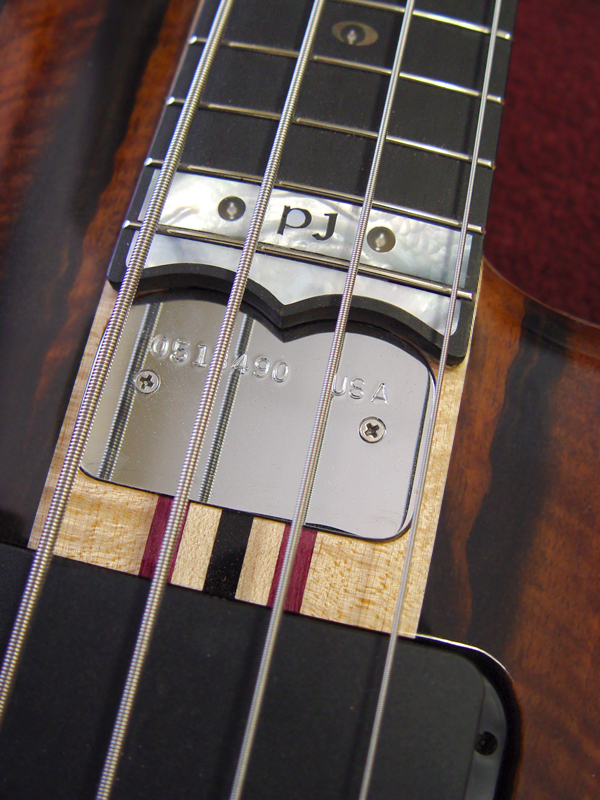 Just under the peghead joint, you can catch a glimpse of the satin neck feel. This finishing technique leaves the neck extremely smooth and fast. 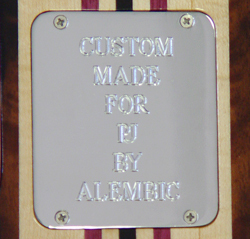 Before we brought the hardware to the chrome plater, we had the battery plate engraved with a special message. The engraving is very deep, not like what you see at the mall trophy shops, it has dimension. It's absolutely lovely. When a dream starts, it's hard to put away. It just keeps expanding and growing. 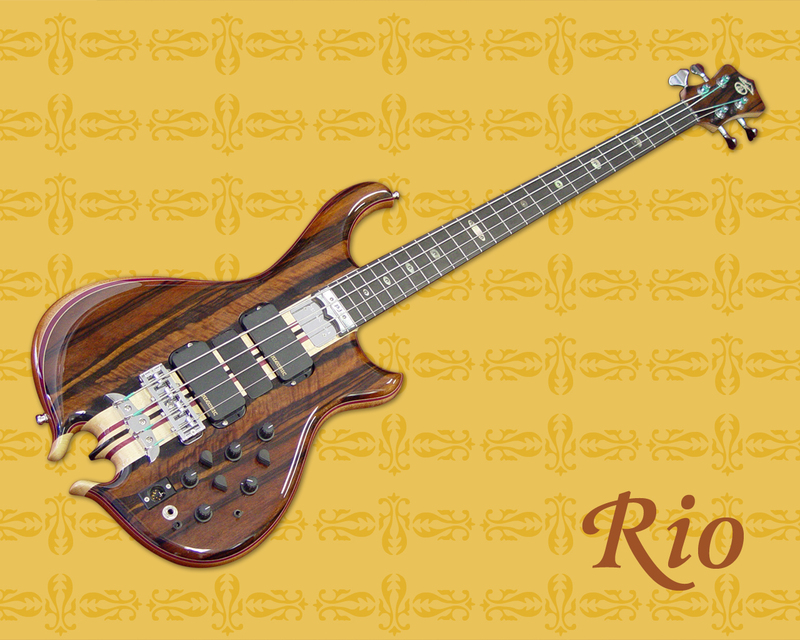 Paulo's Rio bass is a tangible symbol of a dream realized. We are truly honored to have been able to participate in it. 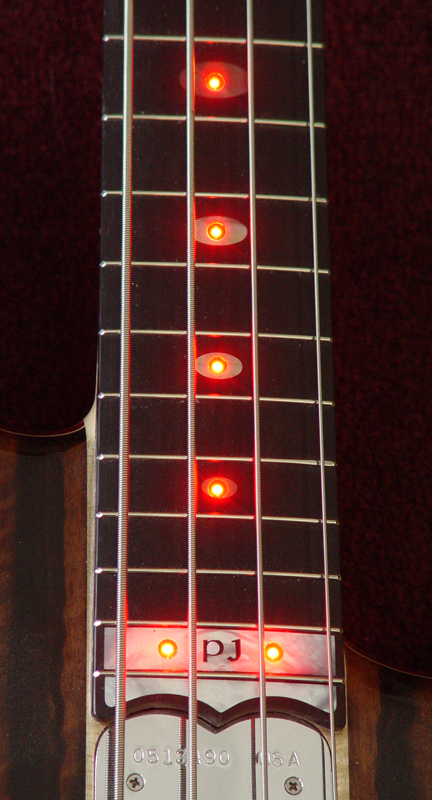 Text and Photographs of bass © 2005 Alembic, Inc.